Peer review is the major quality keep measure for any academic journal. In this process, experts in the relevant fields, analyze the scholarly work from every perception, including its writing, the accuracy of its technical content, its documentation, and its impact on and implication to the discipline. The journal is based on independent and unbiased double-blinded peer-reviewed principles. Only unpublished papers that are not under review for publication elsewhere can be submitted. Reviewers play a pivotal role in scholarly publishing, and their valuable opinions certify the quality of the article under thoughtfulness. Peer review helps to approve research, establishing a standard for evaluation within research communities. All manuscripts submitted for publication are strictly reviewed for their originality, methodology, importance, quality, ethical nature and suitability for the journal. International Archives of BioMedical and Clinical Research uses a well-constructed scheme for the evaluation process. 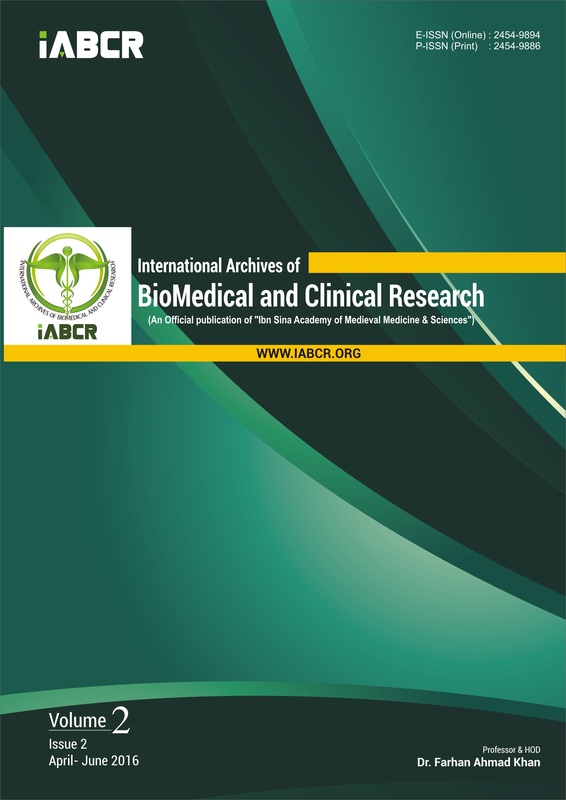 The editor-in-chief has full authority over the editorial and scientific content of the International Archives of BioMedical and Clinical Research and the timing of publication of the content.